Ivan Ceh came from Rieka, a seaport city on the northeast coast of the Adriatic Sea, in what is now Croatia. He emigrated from there in 1902, eventually settling in Donora in 1903. He worked at the wire mill in town, and he died at his home, on Fifth Street, just up the hill from Saint Michael the Archangel Byzantine Catholic Church. Jane Kirkwood, known by everyone as Jeanie, hailed from Wishaw, Scotland, a scraggly suburb of Glasgow, emigrating at age 39 in 1911. A widow, Jeanie also died at her home, at 121 Ida Avenue, in the middle of Donora’s famed Cement City. Ceh and Kirkwood were the first Donorans to die in the Donora Death Fog of 1948. At least 18 more followed, most of them the same night. Ceh died at 1:30 AM from sudden heart failure, Jeanie at 2:00 AM of asthma. Both of them died on the deadliest day of the smog, Saturday, October 30, 1948. They most likely did not die at exactly those times, though. Chaos during the smog made more specific determinations all but impossible. Hundreds of residents that weekend experienced severe breathing problems, and from early Saturday morning to early Sunday morning, doctors, nurses, police officers, firefighters, and undertakers worked around the clock to deal with the sick, dying, and dead. The local hospital, Charleroi-Monessen Hospital, was inundated with patients from Donora. Physicians and coroners working in such conditions would have used the closest approximation possible for a time of death. The graphics below show the official times of death for each victim, as shown on the death certificate. The smog killed far more people than the 20 shown above. Thousands were sickened during the smog, and untold hundreds are reported to have died later as a result of the smog’s lingering effects. Local, state, and federal agencies at the time used their own criteria for determining the official list of victims. They generally used an end-date of Sunday, October 31. Historians at the Donora Historical Society (DHS), however, have used other criteria for identifying the last death. They generally have been more flexible than the Government and have listed people who died during or shortly after the smog. I have chosen to use DHS’s approach. The person’s death must be directly associated with the smog, through either a physician’s or coroner’s reported cause of death or through contemporaneous, reasonably reliable third-person reports. The death certificate, when available, must indicate some kind of cardiopulmonary disorder as a primary or secondary cause of death. 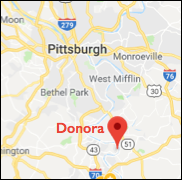 Typical disorders for an event like the Donora smog would include asthma, pneumonia, heart attack, heart failure (sometimes called “cardiac asthma”), and so forth. The person must have died either during the smog (October 26 through the afternoon of October 31) or within a reasonably short time thereafter. If a person died after the afternoon of October 31, the death certificate must indicate that the person died as a result of the smog, or alternately, by a condition that could reasonably be considered to have been smog-related. Individuals living outside Donora, Webster, and their immediate environs will not be considered unless it can be determined with a high degree of confidence that the person spent a significant amount of time in Donora or Webster during the smog even though they might have lived elsewhere. Those individuals must also meet the previous criteria. The following individuals are sometimes listed as victims, but as far as I have been able to determine they were not: Clifford DeVore, George Hvizdak (Weisdack), John Poklemba, Mary Rozik, and Alice Ward. They died too long after the event to qualify. As of this writing, I haven’t been able to confirm whether Steve Faulchak or Ruth Jones, sometimes listed as being victims, did in fact die in the smog.